Being a mum to four girls there is one programme I have watched a lot and that is Dora the Explorer. With memorable characters like Boots and Back Pack and the added bonus that it begins to teach your kids Spanish, it is a cartoon that I've always been happy to put on. And just like my children, Dora has changed over time. This Monday she is back with a whole new bunch of friends. Dora's new programme, Dora and Friends : Into The City will be premiering over on Nickolodeon at 5pm on the 3rd of November and what better way to celebrate than with a party. I have been picked along with some other lovely bloggers to host a fantastic Twitter party, hooray!!! 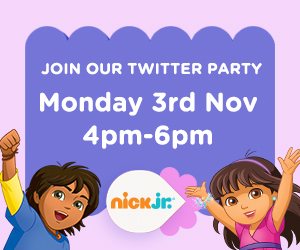 So come and join myself and Dora over on Twitter between 4 and 6pm on Monday for lots of fun, games and competitions. With plenty of prizes to be won, this is one party you don't want to miss. Simply follow myself @MamaMummyMum and @UKMumstv and join in and using the #doraandfriends hash tag. I hope to see you all there, looking forward to tweeting with you all. Ooh, I like Dora, my kids haven't watched her before. We don't have Nickelodeon though, I wonder if it will be out on dvd at some point..?